Your popular Wellington Square awaits! Fantastic buy at this price. This complex is well undervalued for the area. Look at the comps at comparable complexes nearby and you will be amazed at the value for this unit. 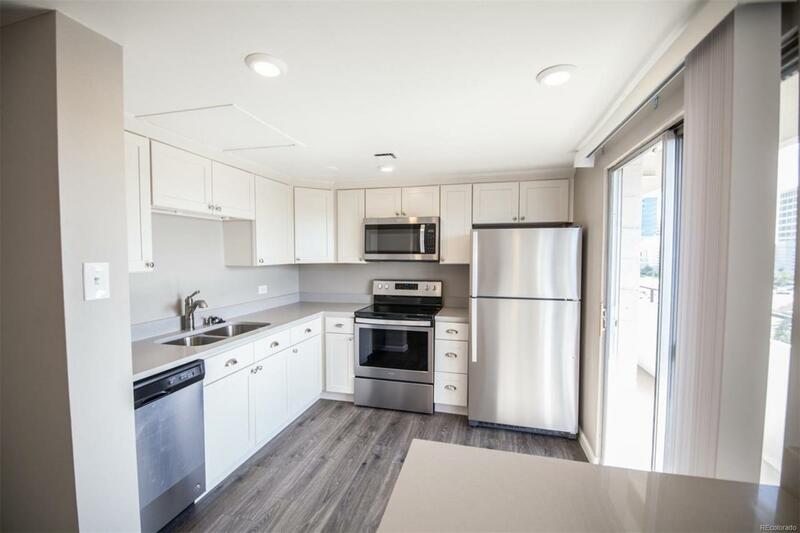 This home has been tastefully updated and remodeled throughout. All new carpet and paint throughout! 2 bed/2bath! 1 dedicated Master Bedroom and private master bath! Large family room with cozy wood burning fireplace! The surrounding windows make this home feel fresh and bright! The dining room and kitchen are adjacent and provide access to the covered balcony/patio. Mountain or City views! The kitchen is gorgeous with all new shaker style cabinets, new quartz countertops, and all new S/S appliances! HOA amenities cover heat, water, fitness facility, and pool! Underground parking which means no scraping windshields this winter!! Fantastic location with walking distance to the light rail, shopping, restaurants & more! Make home ownership a reality and show today!